In memory of my (long lost) high school days, and inspired by my friend Carri, I give you this mix featuring many of the top songs from my high school era, which was 1985-1989 (I know, I know.... I'm old) in the Homestead, FL area. This mix offers short snippets of songs brought together in the mix to create a nostalgic feeling for those of you that remember that time. 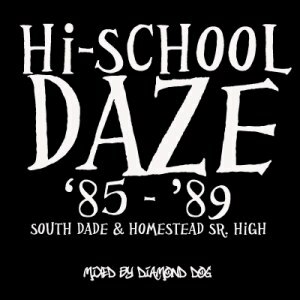 Hi-School Daze will bring back memories for listeners ranging in age from the late 30's to early 40's and features some classics such as Fine Young Cannibals (She Drives Me Crazy), Young MC (Bust A Move), Bon Jovi (Livin On A Prayer), Whitney Houston (How Will I Know) and many more from that era. When you listen to this mix, you are guaranteed to be brought back to a time long ago where the music was so much different than it is today. Milli Vanilli, Madonna, Paula Abdul are but a few names that round this mix out from start to finish. So be sure to check out Hi-School Daze and download it for your listening pleasure & to share with your friends. In honor of the big day... Superbowl Sunday... which is basically a holiday at my house, I bring you Superbowl Shake, which has absolutely NOTHING to do with the Superbowl, but is named this way because I am bringing it to you on... that's right.. Superbowl Sunday. This one is a mashup combining the old... the Jacksons - Shake Your Body Down (To The Ground) (from their 1978 album Destiny) with the new(er)... Pitbull - Shake (from the Ying Yang Twins' 2005 album United State Of Atlanta). This is a great mashup for both old & young & will be great to help get the party started both before the 49ers & Ravens face off and after it's all over. Be sure to sample Superbowl Shake and download it for your cd and/or ipod... it's all free! I hope everyone enjoys this new mashup and I also hope everyone enjoys the big game. Who you pullin' for? My team's Green Bay so I'm just watching for the enjoyment this year. Thanks for your supportof djdiamonddog.com!